Even if NYC Mayor Bloomberg permits the Occupy Wall Street protesters to camp out until next spring or later, how will this alone accomplish anything? By next spring, if progress isn’t made on more tangible fronts, how many participants will choose to get on with the rest of their lives? 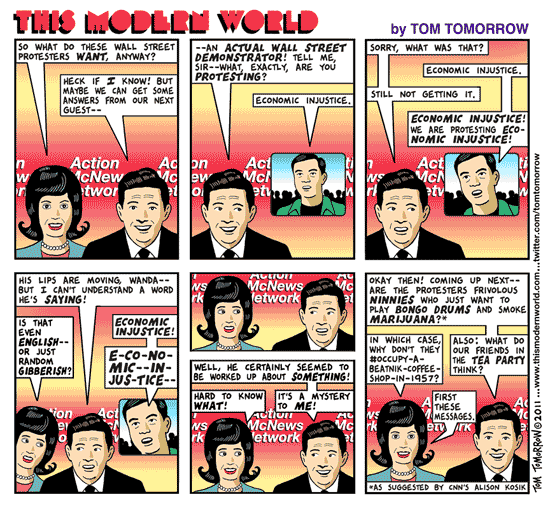 And how will OWS compete for media attention once the primary season gets underway? He goes on to say he thinks it’s likely that OWS end up being “seen as a spark” to spur other people and organizations to address income inequality in more concrete ways. On the one-month anniversary of OWS, participants seemed OK with the unpredictability of where things were headed (VIDEO), pointing to early civil rights activity as examples of how small actions produced big change. But, as mentioned in the Kazin piece, there’s a distinction between a focused goal (e.g., end segregation) and the broader economic themes of OWS. It would appear that OWS is, for the moment, content with its leaderless learn-from-one-another way of existing. Heck, meandering can be fun in warm weather. We’ll see if the participants still feel that way if NYC gets socked with one of more major snowstorms in the coming months. Do they want to be merely ‘a spark’ or leaders of change? M.C. Hammer joins Occupy Wall Street Protestors in Oakland. Speaking of the Oakland OWS debacle, apparently Oakland police aren’t aware that it’s the 21st century. If you want to move protestors, clear and area, or even marginalize an amorphous political movement that’s anti-greed and anti-bad-stuff, this is not how you do it. Even Fox News (on the web) doesn’t sound entirely unsympathetic to the Oakland OWS. This kind of ham-fisted over-reach and over-reaction is the sort of stuff that protest movements are built on, and thrive on. And that’s been true since The Boston Massacre. At least. It’s not how you get the hippies to settle down and go away. Apparently M.C. Hammer no longer wears golden parachute pants. Very disappointing. NoVa raised this issue and I tracked down an article that quotes some of Oakland’s policies on crowd control and links to the PDs policy manual. Meanwhile, this article shows some of the various police weapons in action against other crowds. People keep asking what the OWS protesters want. Honestly, I don’t really know. But I do know what some of them are angry about, income inequality, student loan debt, unemployment, crony capitalism, and now that one has been critically injured in Oakland I think the movement, if that’s what they’re calling it, will face a critical test. Can they maintain their commitment to non-violence in the face of law enforcement and city leaders losing patience with their occupations? Also, winter and cold weather are quickly materializing, how will this factor affect their resolve? There is also concern among the protesters themselves that there are anarchists among their ranks which may undermine the peaceful image they’re trying to maintain. The LA Time has a good rundown of the dilemma facing city officials and police departments across the country. I thought it was a little derelict though that they didn’t mention the Iraqi Vet who was critically injured in Tuesday nights clash with Oakland PD. Leaders in other cities said they don’t want a repeat of that chaos, but it’s unclear how they will eventually oust protesters who refuse to leave. Villaraigosa has instructed city officials to draft a plan for another location for the demonstration. Here’s a little more about the wounded protester and highlights of attempts to break up the occupation. OAKLAND, Calif (Reuters) – More than 1,000 activists protesting economic inequality reclaimed a downtown Oakland plaza late on Wednesday, a day after demonstrators were driven out and an Iraq war veteran was critically hurt in clashes with police. The severe injury of Scott Olsen, 24, a former U.S. Marine who friends said served two tours of duty in Iraq, became a rallying cry among Occupy Wall Street supporters in Oakland and beyond as organizers urged protesters back into the streets. Police kept their distance as protesters returned to the scene of Tuesday’s confrontations, while protesters largely avoided provoking them, although one activist defiantly set up a single, small tent in the square after midnight. The “Occupy Wall Street” protests, which began in New York City last month, take issue with a financial system they say most benefits corporations and the wealthy. They are critical of U.S. government bailouts of big banks, high unemployment and economic inequality. Loosely organized protest groups have since sprung up across the United States and in countries around the world. Tensions were building in several cities where authorities have been treading a fine line between allowing peaceful protest and addressing concerns about trespassing, noise and safety. In an early morning raid in Atlanta, police evicted dozens of protesters from a downtown park and arrested 53 who refused to leave. They were allowed to camp in the park for three weeks, but Mayor Kasim Reed said he decided to evict them because of fire code violations and crowd control issues. Kristof discusses some of the issues he thinks are driving the protests. That alarmist view of the movement is a credit to the (prurient) imagination of its critics, and voyeurs of Occupy Wall Street will be disappointed. More important, while alarmists seem to think that the movement is a “mob” trying to overthrow capitalism, one can make a case that, on the contrary, it highlights the need to restore basic capitalist principles like accountability. But, in recent years, some financiers have chosen to live in a government-backed featherbed. Their platform seems to be socialism for tycoons and capitalism for the rest of us. They’re not evil at all. But when the system allows you more than your fair share, it’s human to grab. That’s what explains featherbedding by both unions and tycoons, and both are impediments to a well-functioning market economy. The upshot is that financial institutions boost leverage in search of supersize profits and bonuses. Banks pretend that risk is eliminated because it’s securitized. Rating agencies accept money to issue an imprimatur that turns out to be meaningless. The system teeters, and then the taxpayer rushes in to bail bankers out. Where’s the accountability. Maybe I’m wrong, it sure wouldn’t be the first time, but I think the middle class has finally woken up to the fact that the deck is stacked against them. I hope we’ve realized we don’t need a savior, we’re on our own, that much is clear. But people are finally expressing their anger and frustration outside of the voting booth so maybe someone will get the hint. I’m a little cynical, they just passed another free trade deal that most Americans didn’t want, so who knows what’s really going on. A Liz Warren in the Senate may be able to level the playing field a little, that’s the hope anyway. People are frustrated with Washington, Republicans and Democrats alike. Congressional approval hovers below 15% and Obama’s not faring all that well in the polls himself. Whether, as some claim, we believe the so-called liberal media blitz blaming “Wall Street” for our woes or you believe the conservative claim that “government” was largely to blame, it’s tough to deny that we’re having trouble climbing out of this recession. While the economy would undoubtedly have been worse without TARP, “Main Street” isn’t in recovery yet. The Tea Party and the OWS protesters aren’t characters in a children’s book, an Ayn Rand novel or science fiction, they’re real people with real concerns for their future. It’s pretty obvious conservatives are worried about Liz Warren. Scott Brown’s campaign coffers have grown substantially since she announced her Senate run. She had gained millions of supporters. With her passionate defense of America’s beleaguered middle class, under assault today from seemingly every direction, she had become like a modern-day Mr. Smith, giving voice to regular citizens astonished at the failure of Washington to protect Main Street—and what increasingly appeared to be its abandonment of middle-class America. If you read this piece in Vanity Fair you’ll discover why she appeals to many of us, and also why she might just be a little different from the usual beltway corporate sponsored politician. I know, I know, corporations are people too, but oddly enough, so are people. She has enemies in the White House and particularly at Treasury. There’s no love lost between Warren and Geithner, especially after her questions during heated oversight hearings. Chris Dodd wasn’t particularly thrilled having her in charge of setting up the CFPB, he wasn’t all that enthusiastic about bringing transparency or consumer protections to the banking industry in the first place. Does anyone miss Chris Dodd? Reid asked Warren to head the congressional panel overseeing the $700 billion bailout. The job was vague, with no clear goals, but Warren would turn it into a tough, prosecutorial committee. She did real investigations, grilled government officials, and issued blunt monthly reports demanding more accountability from banks and better returns for the taxpayer. She held public hearings that were televised, asking the questions that many taxpayers wanted asked—and questions that bankers and Treasury officials did not want to answer. Perhaps the most widely watched hearing is the one that took place in September 2009. A video of part of that hearing can still be found on YouTube, under the title “Elizabeth Warren Makes Timmy Geithner Squirm.” It opens with Warren asking the question that was on the minds of many taxpayers: “A.I.G. has received about $70 billion in TARP money, about $100 billion in loans from the Fed. Do you know where the money went?” What followed during the rest of the hearing was the spectacle of the Treasury secretary tripping over his words, his eyes darting around the room as Warren, calm and prosecutorial, kept hammering him with questions. She wasn’t always a Democrat. Her first big foray into bankruptcy, via a study she conducted to uncover fraud, had a much different result than she expected. In 1978, Congress had passed a law that made it easier for companies and individuals to declare bankruptcy. Warren decided to investigate the reasons why Americans were ending up in bankruptcy court. “I set out to prove they were all a bunch of cheaters,” she said in a 2007 interview. “I was going to expose these people who were taking advantage of the rest of us.” What she found, after conducting with two colleagues one of the most rigorous bankruptcy studies ever, shook her deeply. The vast majority of those in bankruptcy courts, she discovered, were from hardworking middle-class families, people who lost jobs or had “family breakups” or illnesses that wiped out their savings. “It changed my vision,” she said. And of course the vigor with which the banking sector and Republicans continue to vilify, demean, and label her will only increase the support and campaign donations she receives in response. But while audiences applauded her, Warren’s opponents lacerated her. She was called incompetent, power-hungry, ignorant, a media whore, and, in a widely televised moment, a liar, by a Republican congressman during a hearing in May. “It was like she was the Antichrist,” says Roger Beverage, the president of the Oklahoma Bankers Association and one of the few bankers who publicly supported her. She had become the lightning rod for the opposition to the C.F.P.B. Her critics characterize her as an elitist or a shark in school marms clothing, but while she speaks the language of the middle class, she also knows the secret handshakes and tricks of the trade of the financial elite. It’s no wonder they’ve spent so much money trying to keep her away from the levers of power. We’ll see how tough she is, she’ll need it, but I believe she’s got what it takes to both win and make a difference. There will be a lot of eyes on the Senate race in Massachusetts. We could have some fun with this today. Oct. 15th. is the day OWS, or versions of it, goes global so it’s high time we advertise and capitalize it. I love the stock quotes in there. Citi’s CEO Vikram Pandit said at a breakfast meeting on Wednesday that he’d be happy to meet with protesters, and he added that their sentiments were “completely understandable,” according to reports by Bloomberg and Fortune magazine. “Trust has been broken between financial institutions and the citizens of the U.S., and that is Wall Street’s job to reach out to Main Street and rebuild that trust,” Pandit said. What better way to do it than a corporate sponsorship? Doesn’t “Occupy Wall Street By Citigroup” sound more friendly? And wouldn’t America make a faster comeback if corporations would simply pay people to protest against them? This photo has been making the rounds on Facebook. . . rumor also has it that it has been photoshopped to add people. I don’t know one way or the other, but I loved this comment that I saw posted on it: What they forget, when they scuttle the economy and put alot of people out of work, those people have alot of time on their hands.